On Thursday September 13th players from twelve counties made their way to Wolvey to play the final game of the season. 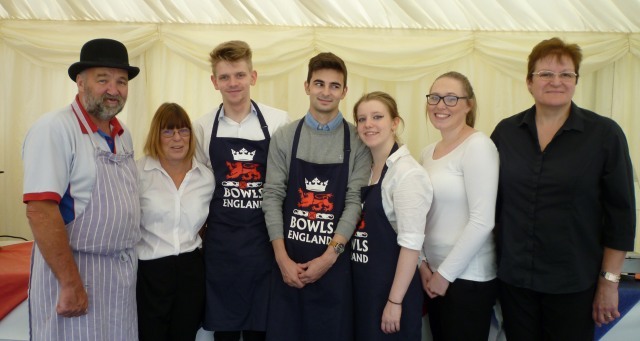 Among them, the Bowls England Presidential team consisting of Bill Smith, Hazel Marke and Paul Robson. This was against Midland Counties which consists of seven counties. It was also their last game of the season so both teams were keen to finish on a win. 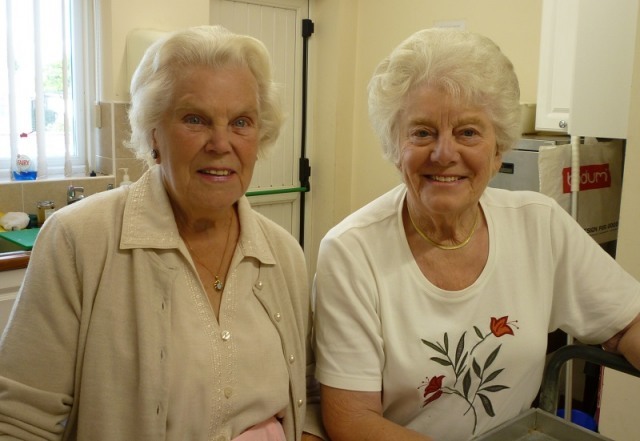 At 12.30 the girls in the kitchen were ready to make rolls, or sausage rolls plus salad to order, at a pound a time. They were kept pretty busy by the hungry arrivals who were expecting a buffet lunch. 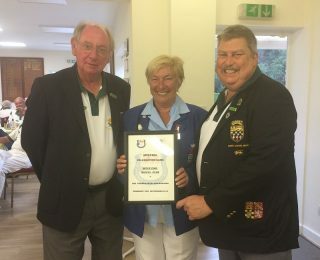 The President of the club, Michael welcomed President Aubrey Brookhouse and Captain of the day Cyndy Lee to his club and then handed the green over for the match. When we started the game the sun was shining and it was feeling very warm. Shirt sleeves and sun hats to start. After about eight ends the sun vanished and the wind started and it began to feel rather chilly. Sun hats removed and fleeces now worn. There were a few hardy souls who managed without the extra layer. The green played beautifully, a lovely pace. Tim, the green keeper, had done a very good job. He was cutting it as we arrived. Laughter could be heard across the six rinks and everyone seemed to be enjoying themselves. Some more than others. After the match we had a fish and chip supper with mushy peas. This was followed by excellent trifles – one large bowl for each table. They were so good that Chris Smith went round each table trying to scrounge any leftovers. Speeches were made by the two captains and top rink prizes given. Final scores were given – 140 for the Midland Counties and 99 for the Friends. But using Stuart Lakes method of counting:- 1+4+0 = 5. So five for Midland Counties. 9+9 = 18. So eighteen for the Friends. A great win for the Friends to finish the year. 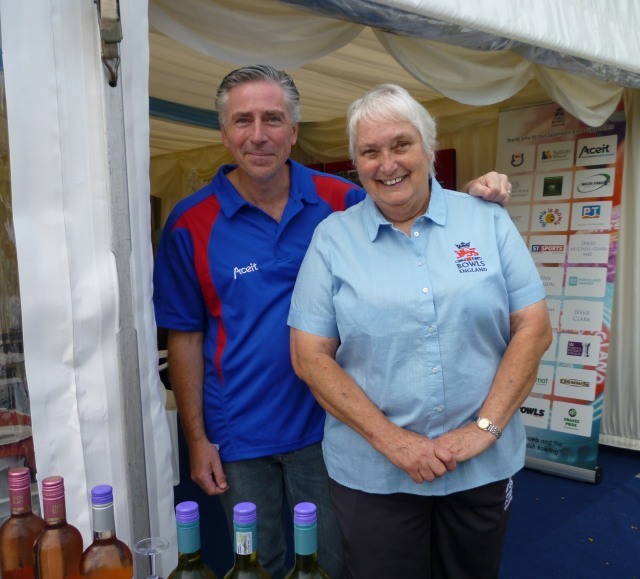 Finally a very big THANK YOU to our governor Adie Lloyd and his wife Kath for arranging all the matches and the teams. They do a wonderful job which usually includes having to find replacements at very late notice. We are all looking forward to seeing what has been arranged for 2019. 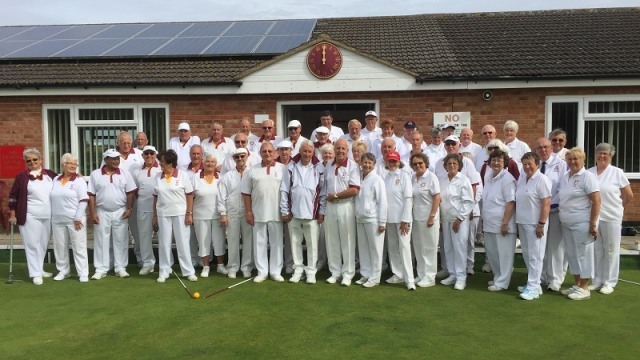 On Monday 10th September ‘The Friends’ visited Irchester BC in Northants for a match to celebrate the Club’s 30th Anniversary. On arrival the Friends players had the opportunity to have a cup of tea or coffee and the earlier arrivals, the chance to sit and chat with their colleagues. 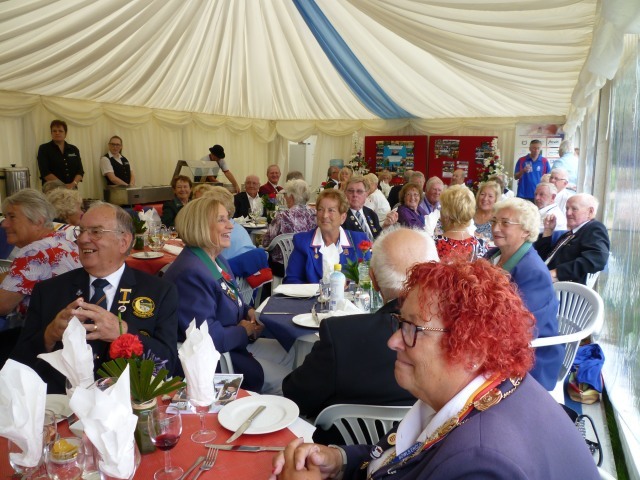 The club then provided a very enjoyable lunch. After a team photo and Spider the Club President welcomed all the players on to the green. The weather was bright and dry, if a little chilly, and a very enjoyable match followed. The hosts won on 4 rinks, but on the two outside rinks the ‘Friends’ were the overwhelming winners and in consequence won the match 122 – 107. 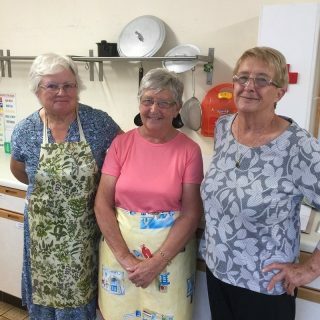 The teams all enjoyed a lovely meal, provided by Pam, Janet and Sue and helpers Alison and Gill. 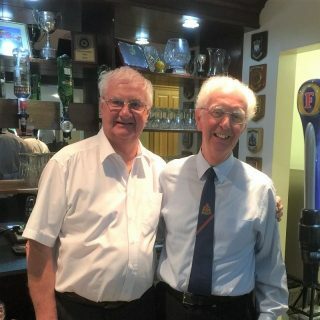 Club President Denis then related a brief history of the club, and Captain Peter thanked the Friends for their visit and extended his thanks to the lady caterers and Andy the barman. Their highest winning ring was duly awarded. In reply Friends captain of the day Geoff Hunt confirmed the great pleasure it was to visit, particularly for him as this was the club he joined when he first moved to the County. 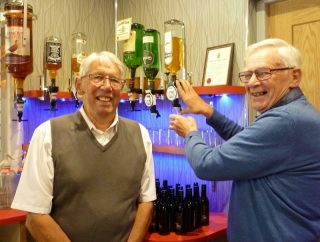 He went on to say that the visit was merged with sadness as former Club Chairman George Willmott had organized the event last year before he sadly passed away. 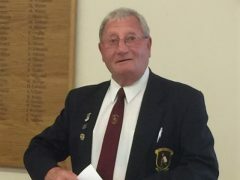 Geoff then gave details about the Friends history and purpose since they were founded in 2005, and the funds they raise, and introduced the 6 Committee Members playing that day in the match, and explaining that players had come from around the Country to play in the match. 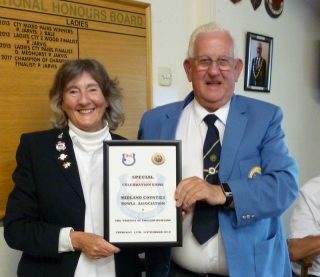 He thanked the Caterers and Bar Staff and finally presented Captain Peter with a framed Certificate to commemorate the visit. 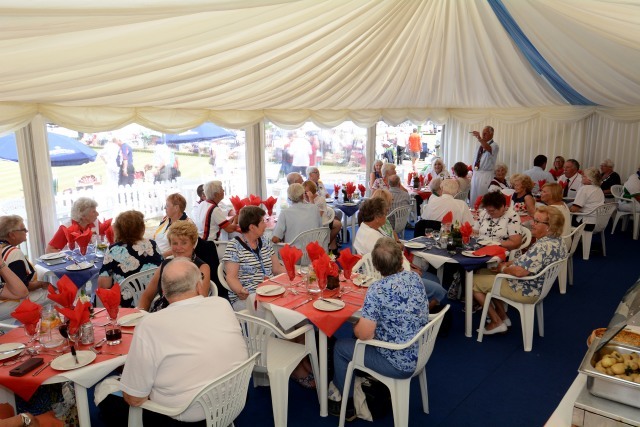 A raffle was then held with an impressive list of prizes, all organized by Brenice widow of George Willmott. 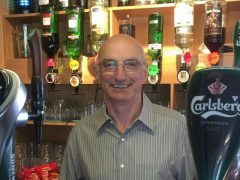 A special mention for Derek who looks after the green’s surrounding gardens. The flowers were beautiful and a treat to behold. A very enjoyable visit, and one hopefully to be remembered by ‘The Romans’. 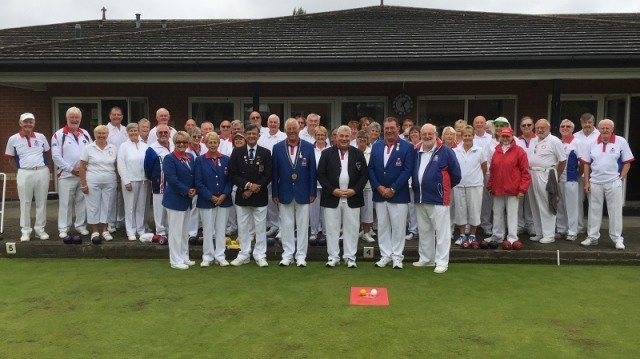 A big day for the Friends and for Bowls England President Bill Smith with his Select side. We gathered at Bill’s Leicestershire club, Goodwood, to play the annual match between the Friends and Bowls England for the Ian Woodcock Claret Jug. We all arrived a bit daunted because of the wet weather, but first settled in for a ploughman’s lunch. Cometh the match, cometh the weather; a wet green – but dry weather. Why were we worried? We tried our hardest, but the President’s team was too strong for us. However, we won the laughter stakes. We retired to our after-match meal, which was gammon steak followed by an individual fresh cream sponge cake each. Delicious. Our captain, our match secretary, Adie Lloyd thanked the club for making us all so welcome, especially for the good food and the good green. He then presented the Claret Jug and a personalised Friend’s framed certificate to Bill. Finally Deepak Tanna, Goodwood ‘s president wished us all a safe journey home and looked forward to us visiting the club again. Deepak is standing for the position of Bowls England President 2022. We wish him well. Adie & Kath had asked us to arrive early to meet them but miscalculation on journey time, and forgetting that no lunch was planned at this game, meant that we arrived so early we caused some surprise to Ian who was setting up the greens. 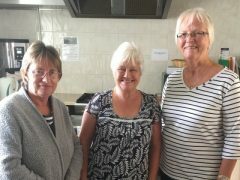 Club Captain Trevor Lofty arrived shortly after, as did Colleen the club caterer for the day so very soon we had coffee, tea and a bacon butty. West End bowlers are rightly pleased with the extension to their clubhouse. 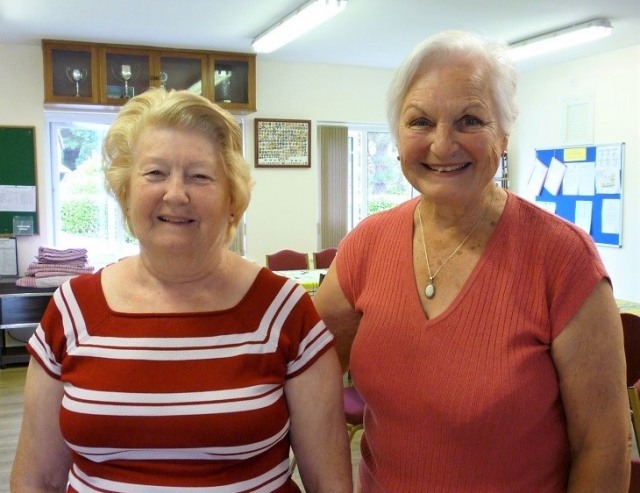 With valuable advice from their local Councillor and Mayor, West End had sought and gained financial assistance in various forms including a £100,000 grant from the London Marathon and grants or loans from local businesses and Bowls England. The club now has sufficient room for 6 rinks and guests to sit comfortably after matches, and provides space for a local Yoga club to meet during the week. They also use the club all year round and have 2 short mats for winter play. Players from both sides arrived in time for the obligatory photographs and after our welcome by Club Captain Trevor we were soon on the green. Trial ends, 3s up and the 21 ends planned, plus a heavier green than some were used to, meant that the break at 10 ends for tea and cake was very welcome. Having sat out in the warm sunshine before the game, the clouds started to build and the temperature dropped quite distinctly. 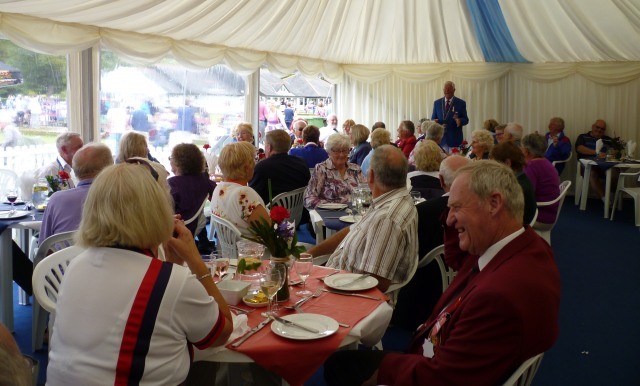 Fortunately all rinks had finished and players were inside enjoying the meal before the very heavy downpour started. It was a very enjoyable meal, provided by Colleen and Val. Liquid refreshments were served by Peter and John at the bar. After the meal we were welcomed again by the Club Captain who expressed some surprise that Friends had travelled from so many counties and indeed one couple for over 100 miles to play in their match. 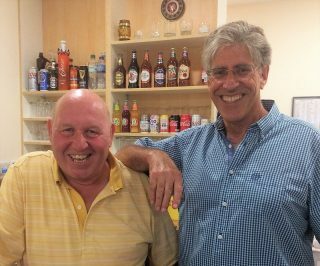 (We had players from 8 Counties namely Berks, Bucks, Hampshire, Herts., Kent, Oxon, Surrey and Wiltshire) Although many of their members hadn’t heard of the Friends before, the match had arisen from a chance meeting by Adie with a club member whilst out in the Algarve last year. A meeting Trevor was very pleased had resulted in this game. Following their toast I responded with thanks to all concerned and congratulated in their absence, Mark Jones and Mark Dunne who had reached the Final of the National Pairs losing to a Somerset duo. Also congratulating two club members Val and Peter (mentioned earlier) who are tying the knot later in the month. I shared details about the Friends; the various advantages of being a member and about our annual donation to BE that they use to back many competitions and to help young bowlers, as well as our continued support of Disability Bowls. Perhaps in the future we will be welcoming some of their players as new Friends. 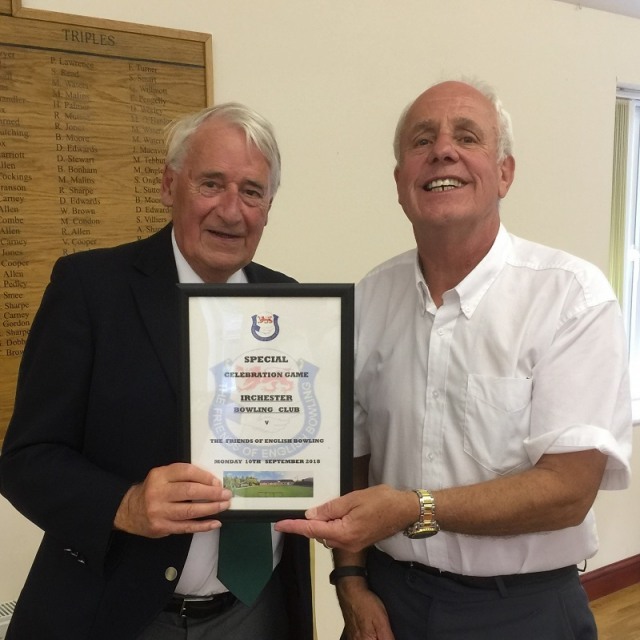 Following the Friend’s AGM on Thursday 30th August – this year held in The Irish Club for the first time – we all moved across to the hallowed greens. With the weather warm and sunny, everyone looked forward to their game. Greens C and D were allocated for the event, and we played on 11 of the rinks. There was great camaraderie on the green, with of course both sides wanting the victory. All too soon, we were packing bowls away and making our way to The Irish Club for a good meal, and a good gossip. 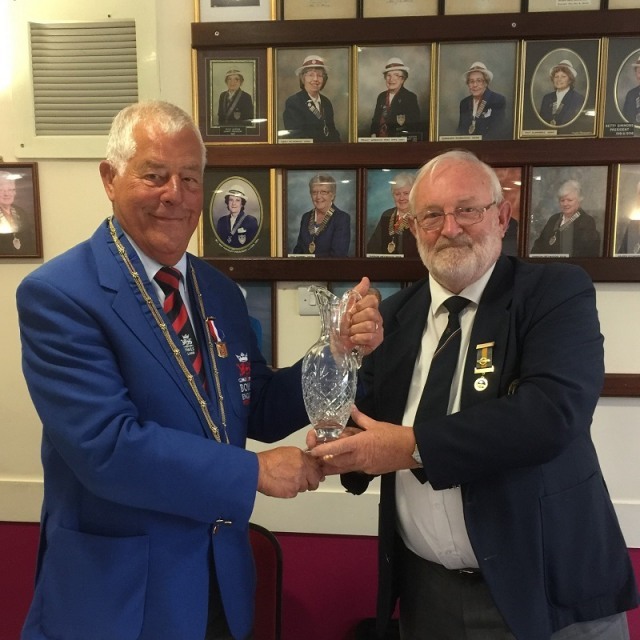 As The Friends were the ‘away team’ this year, BE President Bill Smith presided over the occasion as host; the Irish Club were thanked for their hospitality and concurred by Geoff Hunt in his response as the Friends’ Captain of the day. Having kept us all in suspense, Geoff disclosed the scores – victory went to The Friends 211-185. A magnificent day.